Welcome to the Hike Inn. A backcountry lodge, a gateway to the Appalachian Trail, and one of Georgia’s most distinctive state park destinations. 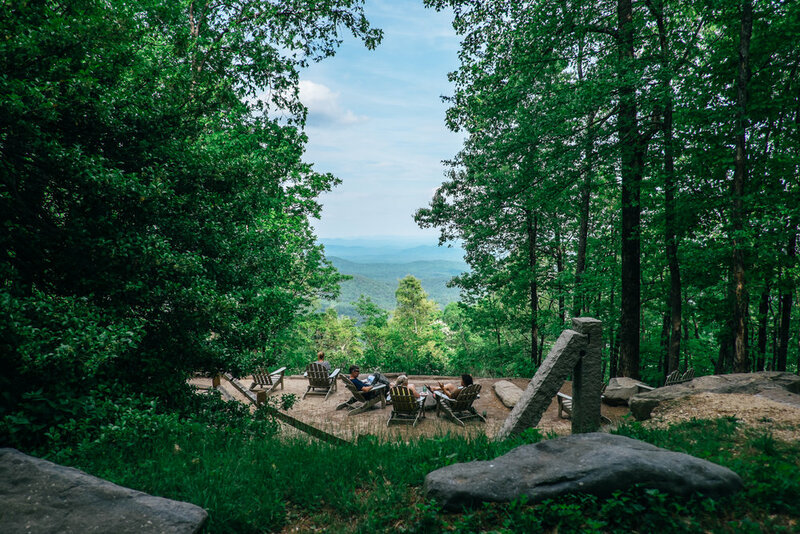 The Inn — open year round — is a sustainably designed Georgia State Park facility nestled in the Chattahoochee National Forest, just a few hours north of Atlanta. Its four main buildings offer twenty private guest rooms, hot showers, fresh linens and home-cooked meals. The easy-to-moderate, five-mile path starting from the top of Amicalola Falls is among the most popular mountain trails in the North Georgia Blue Ridge. And one of its most beautiful and diverse. The two-to-four hour hike crosses small streams, traverses scenic ridges and ambles through stands of mountain laurel and rhododendron. At the heart of a Hike Inn getaway is our ability to offer people many of the comforts of home in a rustic and beautiful setting. A soft bed. A warm shower. And a hot meal. Relaxation, family-style dining and stunning views all make it easy for people, family and friends to do what so few do anymore: spend time enjoying nature together. The guest rooms are comfortable, but not luxurious. Our 20 guest rooms offer bunk beds, furnished linens, blankets, pillows and towels, and ample lighting. Fans for when it’s warm outside — heaters for when it’s not. Hike Inn guests enjoy two hot meals a day in our Dining Hall — breakfast and dinner. Both served family style. We believe this is the best way to meet, break bread and get to know one other. The bathhouse may be our most cherished amenity at the Inn. After a day of hiking, there’s nothing better than a hot shower and a fresh towel. We provide guests with separate facilities for women and men. Hot showers with soap and shampoo. Plenty of sinks, mirrors and blow dryers for freshening up. And ample odorless, conservation-minded composting toilets. Our Sunrise Room is a gathering place for friends and family to spend time together relaxing. Reading from our library. Playing board games. Solving puzzles. Or simply enjoying the warmth of a wood-burning stove. Our wrap-around porch and Adirondack chairs offer stunning views and many of our guests enjoy getting up early for the opportunity to see a awe-inspiring sunrise.